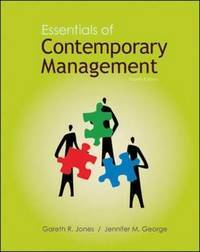 Jones/George, "Essentials of Contemporary Management" is the concise edition of the market bestselling textbook by the same author team. Jones and George are dedicated to the challenge of 'Making It Real' for students. The authors present management in a way that makes its relevance obvious even to students who might lack exposure to a 'real-life' management context. This is accomplished thru a diverse set of examples, and the unique, and most popular feature of the text, the 'Manager as a Person' Chapter 2. This chapter discusses managers as real people with their own personalities, strengths, weaknesses, opportunities, and problems and this theme is carried thru the remaining chapters. This text also discusses the importance of management competencies - the specific set of skills, abilities, and experiences that gives one manager the ability to perform at a higher level than another in a specific context. The themes of diversity, ethics, globalization, and information technology are integrated throughout.